Dragon Fruit is famous in Thailand, Vietnam, Israel and Sri Lanka. In India, commercial cultivation of this fruit is picking up and in Nagaland some farmers and fruit lovers have initiated its cultivation. The Dream Dragon Fruit Farm at Shitovi village in Dimapur district is the first farm where exotic Dragon Fruit is produced and sold by demand only. Ms. Lucy Ngullie Thomas has been growing Red, White and Yellow Dragon Fruits since 2013 besides other exotic fruits. The 5 hectares Dream Dragon Fruit Farm is well maintained and adopts all technical cultural practices. This is the only dragon fruit farm in the state which has healthy and well maintained Mother Plants of Red and White varieties producing cuttings for sales and propagation. 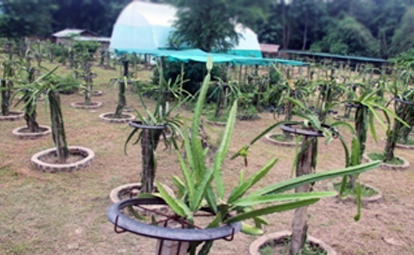 The Dream Dragon Fruit Farm is an Accredited Nursery with 1 Star rating by the accrediting authority under Central Institute of Horticulture (CIH) and the owner is now capable to produce and sell dragon fruit cuttings to interested farmers throughout the country. 1. The plant comes to bearing within a year after planting. 2. Flowering commences from May till October which means fruits are harvested beginning June till mid-December. 3. The average yield per pillar (3-4 plants) per year is about 15 kgs. 4. Fruit weight varies from 300 to 500 grams.